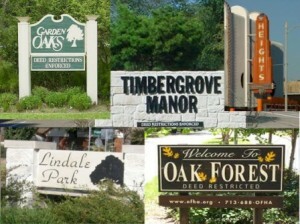 Inner Loop Neighborhoods and Close-in North and West Neighborhoods are covered in this blog. I sell new and resale homes in some of Houston’s older inner loop neighborhoods. I can’t be an expert everywhere, so I sell in subdivisions nearby where I live. It’s not happenstance that I live in the Heights…I love old homes and old neighborhoods. This site is divided into Pages and Blog Posts. Pages cover individual Inner Loop neighborhoods that are close to the 610 N Loop. These give some back ground info on the area, my opinion of the area, links to Civic Associations, and more. My blog is where the real content is, and the posts contain more timely information: neighborhood prices; new construction in the area; highlights of different builders, etc. Posts may talk about a specific house for sale, or may be more evergreen in nature. If I write on Heights new construction house prices in June, the information is probably good for a year. It’s not going to change quickly. I give my opinion in these posts. I.e., I love the Heights area of Brooke Smith. It’s a little rough looking though, so if you are moving from Bellaire or Cinco Ranch, you aren’t going to like it. It’s not all “uniform and pretty”. To aid in navigation, my Interactive Map of Neighborhoods not only shows where these neighborhoods are; they link to posts about the area. A blog unfortunately is like a monolog: I write about stuff and hope you like it, or get pissed off about it, or at least find it helpful in your home buying and selling. I don’t know though unless you tell me. Comments and emails are appreciated. So, as you go through the neighborhood pages that interest you, click on the blog categories to see posts about your inner loop neighborhoods.